All too often after a long day, with hunger overcoming culinary imagination, the temptation to reach for some pasta and a jar of pesto can be overwhelming. 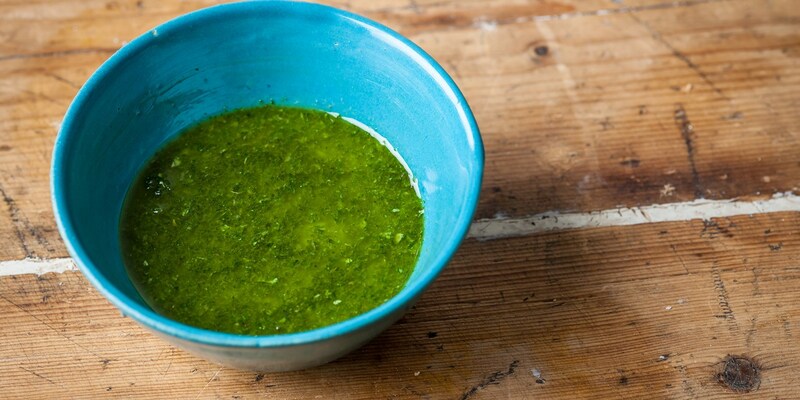 However, next time this carbohydrate craving strikes leave the jar at the back of the cupboard in favour of fresh pesto - Adam Grey’s basil pesto recipe can be knocked up in less than ten minutes, meaning you can prepare it while the pasta’s cooking. It doesn’t get much fresher than that! Try Rosana McPhee's Avocado pesto for a healthy alternative twist. Of course, the world of pesto extends far beyond pasta, and the sauce can be a delicious and colourful accompaniment to meat and fish too. Peter Gordon’s beef pesto dish is a Sugar Club staple, while Anna Hansen livens up her lamb shank recipe with a zingy pesto made from Persian limes. If you are not catering for carnivores, David Everitt-Matthias’ artichoke orzotto is served with an impressive peanut pesto, and by substituting Parmesan and chicken stock for vegetarian alternatives it can make a wonderful meat-free main.